Originally shared by our partners at the State University of New York College of Environmental Science and Forestry (ESF), Karen Moore discusses the work of ESF’s professors and students to conserve piping plovers along the shores of New Jersey and Lake Ontario. High water on Lake Ontario, urbanization of the New Jersey shore and a growing predator population are among the challenges facing one of America’s iconic shorebirds and the conservationists determined to restore the bird’s population. Piping plovers are found along the Atlantic Coast and in the Great Lakes and Midwest regions. Unique to North America, the birds nest on open, sandy beaches, making them vulnerable to predators and the dangers of being in close proximity to humans who use the beaches for recreation. Piping plover conservation is important because the birds nest on beaches where they interact with people, Cohen said. “They’re affected by people all the time.” Piping plovers build nests where people go for recreation, build houses and drive to go fishing. “Just about every conceivable form of coastal human activity that affects sandy beaches on the Atlantic Coasts interacts with the piping plovers and causes problems for them in terms of disturbing them when they’re trying to nest,” Cohen said. Compounding the problem is increasing predator populations that prey on the birds and their eggs. For researchers, it’s easy to become attached to the species with young that look like they stepped out of a Pixar movie and life challenges that mirror human’s, Cohen said. “You get to observe their behavior all the time when you’re checking their nest every day. Each bird seems to have a different personality and then the chicks hatch and they’re tiny, little, cute fuzzballs. You watch them grow and you see the things that are threats. They lose their young … and they have to start over again when they lose their nest,” Cohen said. Cohen and ESF graduate student Michelle Stantial are working to lessen one of those difficulties as they study the threat from predators. Soon after piping plovers were put on the endangered list, exclosure cages – a welded-wire kind of fence about 10 feet in diameter with a soft-cover roof – were used to prevent predators from getting to the eggs. The cages allow the birds to walk in and out but keep out predators such as foxes, skunks and other birds. They were “very successful in getting more nests to hatch,” Cohen said. Unfortunately, some predators learned the cages signaled a potential nest and would wait to attack the adults as they came out of the cage. “Over the last 25 years people noticed this can become a real problem. Questions were asked whether it was worth it to use these exclosure cages,” said Cohen, who joined a group studying the pros and cons of using the cages. The group developed a web-based tool that allows conservationists to enter the data on nest survival and loss of nests to abandonment (when an adult leaves the nest unattended, possibly because the adult died). Once researchers input their data, the Decision Support Tool provides information to help make a decision for a particular beach. “Sometimes it’s hard to know. Some people panic when they lose nests and want to pull them all, but then they’re exposing the nests to predators,” said Cohen. The next phase is assisting other researchers and conservationists as they learn the system. Cohen was the recent recipient of a $21,751 grant from the New York State Environmental Protection Fund to help restore the piping plover to Lake Ontario. The plover conservation community in New York is looking at ways to protect and restore habitat to get its population to solidify its foothold and grow, he said. However, high water levels from heavy spring rains may hamper this year’s nesting. “It has prevented plovers from nesting there so far this year,” Cohen said. One bird was seen at Sandy Island Beach State Park in mid-May but it didn’t stay. As of the beginning of June, one other bird was seen foraging in the area. “We hope if the water comes down some more we will get some late nesting. But if that was going to happen, it would have to be in the next couple of weeks,” said Cohen. Stantial, a graduate student working on her Ph.D., is studying piping plovers in New Jersey. While the Atlantic Coast piping plovers, in general, have been doing relatively well in the last 20 years, New Jersey is “a little different,” she said. Since the species was placed on the endangered species list, observers have seen no increases in abundance in New Jersey. “We’re trying to figure out why and what we can do to help increase the number of nesting pairs and increase productivity in New Jersey specifically,” she said. “I think a lot of it has to do with the lack of habitat. If you think about the New Jersey coastline, there are a lot of barrier islands but a lot of it’s been built up by people,” she said. Holgate, which is home to part of the Edwin B. Forsythe National Wildlife Refuge, is a two-and-a-half mile portion of the beach and marshland that is closed from March 1 to Sept. 1. This gives animals, including the piping plovers, a large window to carry out nesting and other activities undisturbed. “They have a whole season human-free,” she said. Field observations will continue this summer, followed by data analysis and recommendations for specific management that will maximize ideal piping plover breeding habitat and minimize the effects of predation and human disturbance, according to Stantial. A piping plover data collection app is also being developed where people can collect the same type of data all along Atlantic Coast to go into one database. “We’re mid-project now,” she said. Those spots are often created when hurricanes hit the coast; however, if a hurricane hits too early in the season, it can be detrimental to the bird’s reproductive season. The birds forage in mudflats that are created when storms deposit sand in tidal areas. “So they really evolved to take advantage of habitat created by storms,” Cohen said. However, rising sea levels and beach erosion could prove too much for piping plover nesting grounds. In an effort to predict where the piping plovers habitat will be over time, models have been run by Virginia Tech and the U.S. Geological Survey to predict the effect that sea level rise and climate change will have on the coast. “There’s probably places where new habitat will arise, but a lot of places where it may be gone after the sea level gets too high for barrier islands to persist,” said Cohen. This entry was posted in Blog entries, coastal resilience, Endangered Species, Habitat restoration, Migratory birds, National wildlife refuges, Partnerships and tagged Lake Ontario, New Jersey, piping plover, piping plovers, suny-esf on July 21, 2017 by arielkallenbachFWS. 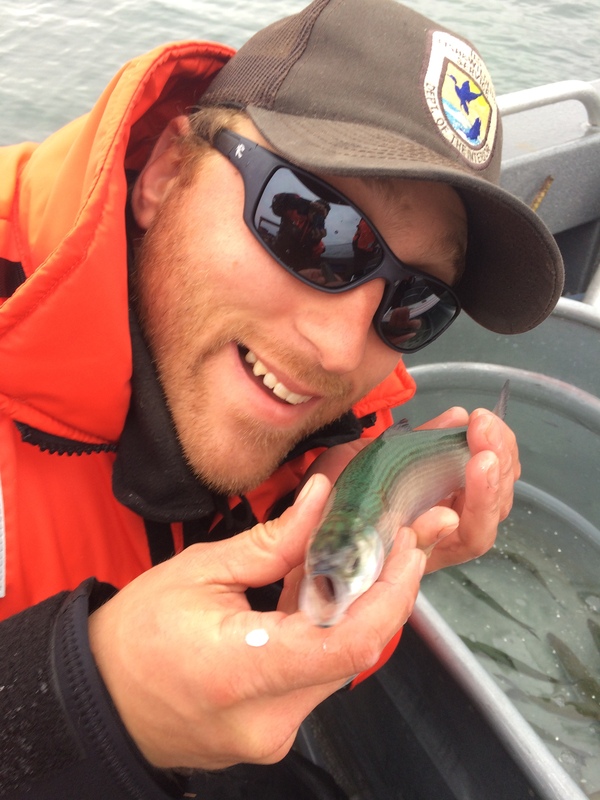 Today we hear from Curt Karboski, fish biologist with the Lower Great Lakes Fish and Wildlife Conservation Office located in western New York. He’s part of a team working to restore iconic fish species such as lake trout and lake sturgeon to the Great Lakes. Join Curt and his team in the Niagara Gorge, located below Niagara Falls as they search for lake trout – the largest trout native to the Great Lakes. 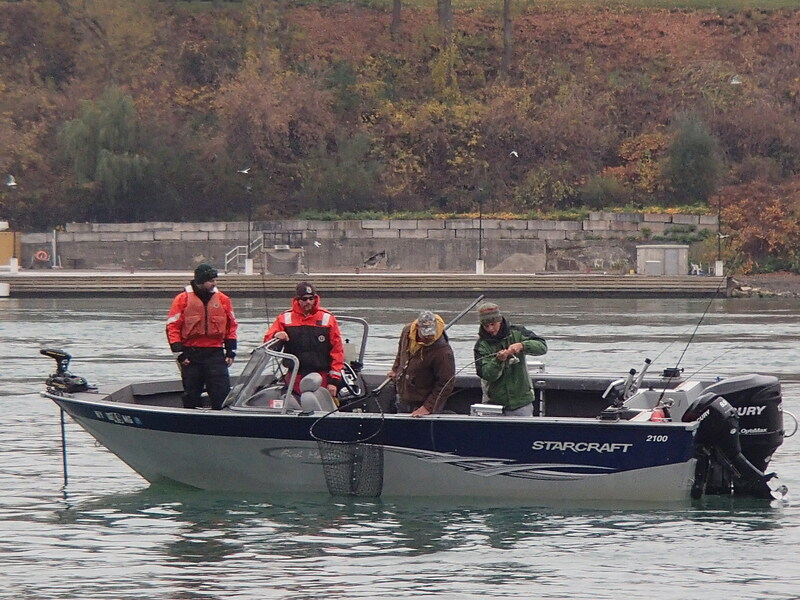 In a time of year when only the most die-hard lake trout and steelhead anglers flock to Niagara Gorge, it is rare to see fish biologists plying the waters alongside them. 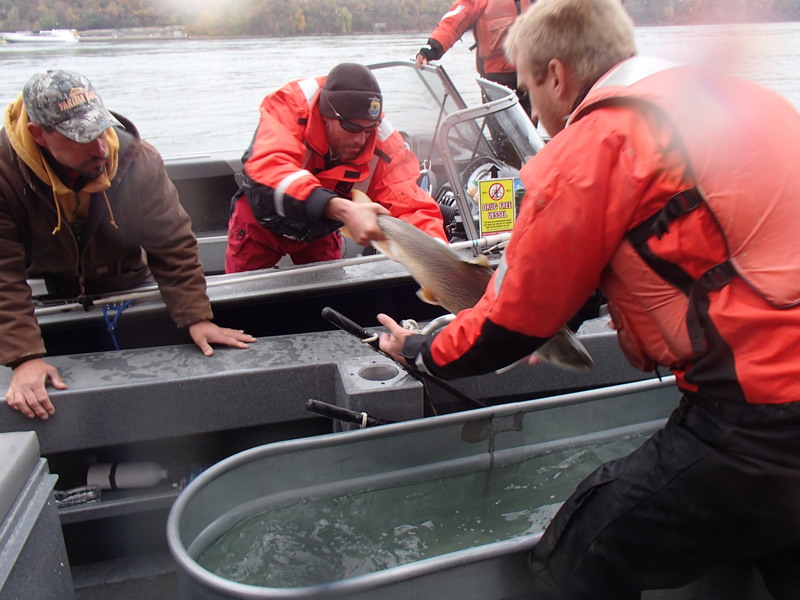 But on a cold rainy day in November, biologists from the Lower Great Lakes Fish and Wildlife Conservation Office were there, relying on the knowledge and skill of a local charter captain to help catch lake trout they needed in order to complete a study. 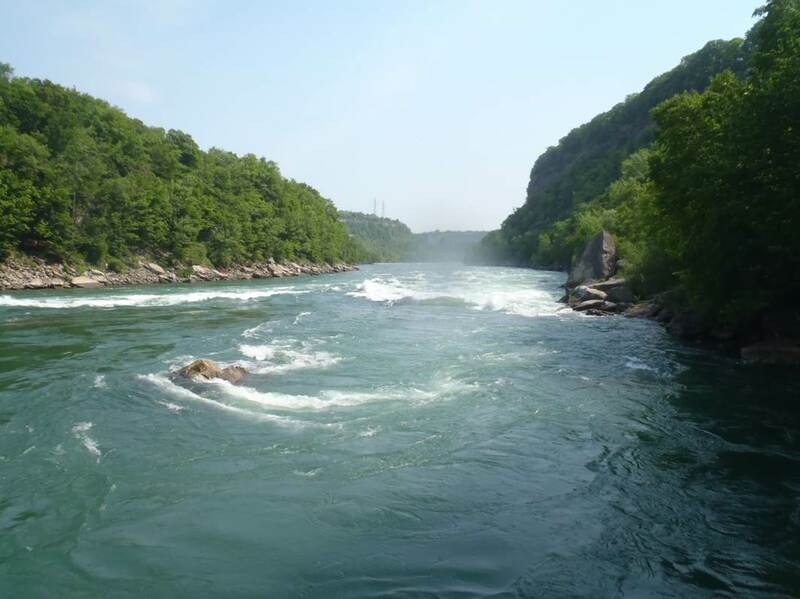 The highly turbulent waters and strong flows downstream of Niagara Falls make it impossible to use standard fish-sampling gear without harming the fish or endangering the crew. An estimated 100,000 cubic feet of water per second comes over Niagara Falls, and our GPS has shown us moving as much as 15 mph with the motor idling. Thus, we enlisted assistance from a local captain who has years of experience angling for lake trout in these waters, and in spite of the weather, we collected 22 lake trout! In conducting our study, we were looking to answer specific questions such as; where do lake trout spend their time in the river and is it seasonal?, when do they leave the river and enter Lake Ontario?, and is their location important to their growth and reproduction? This information will help guide biologists when making decisions on stocking lake trout and conserving their habitat to restore this valuable fishery. In a protected area along the gorge, we moored the U.S. Fish and Wildlife Service’s vessel Linnaeus, to be used as a stream-side platform for measuring fish and implanting them with a tag. 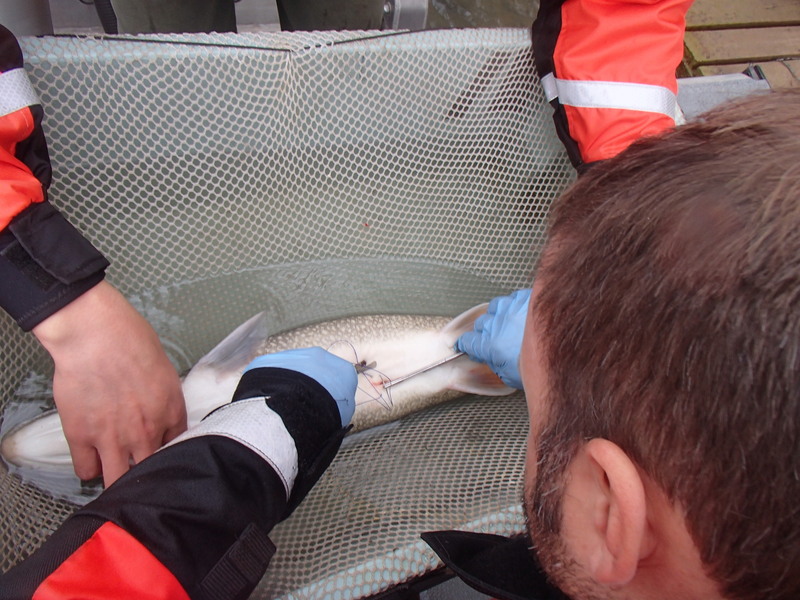 After collecting the lake trout, we transferred them on board the Linnaeus where we recorded length, weight and gender; then anesthetized ten females and surgically implanted them with acoustic tags. Lake trout are real wanderers traveling many miles in search of food, and some return to the same spawning beds each year. The acoustic tags transmit a series of pings that can be decoded by underwater receivers and deliver information on individual fish. As the tagged fish move through the river, an array of acoustic receivers detect the pings sent out by the tag, helping us identify the location and depth of each fish, and the amount of time they spend in any given area. The long battery life of the acoustic tag makes it possible to track the fish for several years, allowing us to learn more about spawning behavior and the types of habitats that are key to maintaining a healthy population. As top predators, lake trout are ecologically important in helping to maintain balance among other species, creating space for aquatic life in the lake. Lake trout are economically important and have historically supported a strong commercial and recreational fishing industry. But by the 1930’s, pollution, over-fishing and the invasive sea lamprey led to their decline throughout the Great Lakes, and by the 1950’s they had completely disappeared from Lake Ontario. Since lake trout do not reproduce until they are at least 6 to 10 years old, it takes a long time for populations to rebuild themselves when their numbers are very low. A stocking program, in concert with active sea lamprey control that began in 1971, has been helping to restore the lake trout. The Service conducts these programs with state, Tribal and Canadian partners on the Great Lakes. 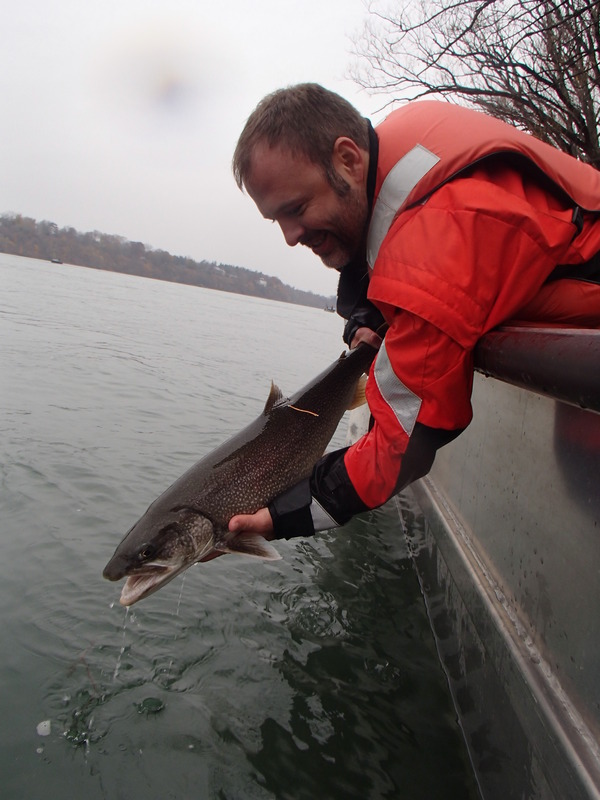 According to USGS Biologist Brian Lantry, recent trawl surveys found wild lake trout juveniles, suggesting there may be natural reproduction occurring again in the Niagara River region. Beginning in spring, we will be back on the river and on the lake alongside our fellow die-hard anglers in search of evidence that our Great Lake trout are coming back from the brink. Understanding their spawning behavior and habitat preferences in the Niagara Gorge will help us manage towards a self-sustaining population and inform future decisions on conserving habitat. 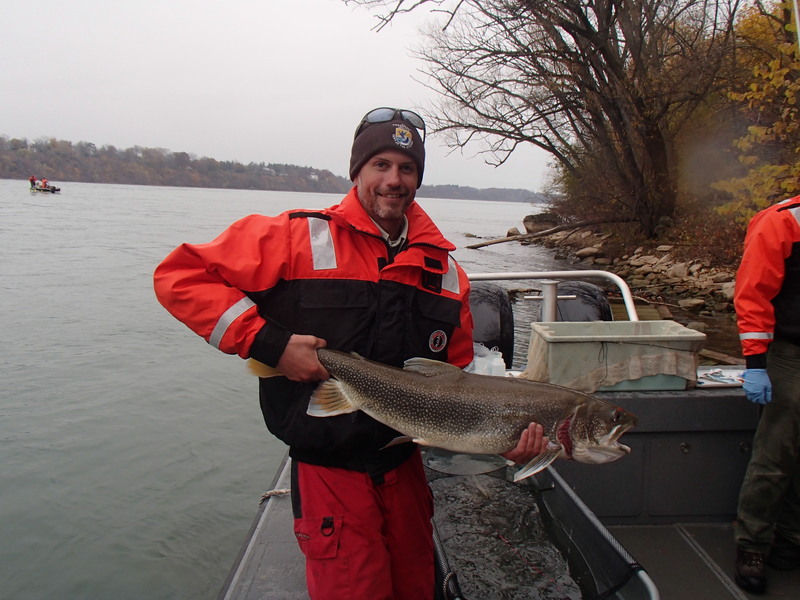 This entry was posted in Blog entries, Fisheries, Habitat restoration, Science and research and tagged fish restoration, fish tagging, fisheries, great lakes, Lake Ontario, lake trout, Lower Great Lakes Fisheries Resource Office, Niagra falls, niagra gorge, partnerships, USGS on January 19, 2016 by U.S. Fish and Wildlife Service.